Toyota's JDM EXY10, better known as the Sera, was named after the French word for will be. Today's Nice Price or Crack Pipe Sera will be a rare sight here in the US, and it will be a freakin' challenge to get registered here. But, the biggest question will be, all things considered, does it cost too much? Have you ever seen an the Fire Department use a hydraulic jaws of life to cut up a car, it's pretty impressive how quickly they can peel back the lid like Popeye's can of spinach. That probably wasn't the tool of choice in the creation of yesterday's custom 1989 Taurus SHO pickup, but the conversion sure breathed new life into what was once a wrecked hot Ford sedan. The result seemed to be generally appreciated as it came away with a narrow 52% Nice Price win, and it probably boosted sales of Sawzalls nationwide too. Toyota once took a knife to the top of their Starlet-based coupe, the Paseo, in the creation of a convertible edition. That diminutive drop top was sold in the US, and reduced the Paseo's yawn factor by about 15%, but it still remained a tepid ride. Coincidentally, have you ever noticed that at many Asian restaurants - particularly Japanese and Chinese - the menus are frequently in both English and the restaurateur's native tongue - even when tongue isn't on the menu? Invariably, the food on the English side is neither as adventuresome nor as spicy as the other, and sometimes that fact relates to cars as well. Today's 1992 Toyota Sera comes from the native side of the menu, and while not so spicy, its bubbly canopy roof will ensure that, come summer, it's hot. Based on the 1.5-litre 5E-FHE-powered Starlet, the Japan-only Sera looks like a mad mixture of Celica, Mazda MX-3 and something that might get jacked in Mos Eisley. The biggest feature of the small 2+2 is its butterfly doors which open up and forward and require small movable pane windowlets to allow the pass-through of tasty drive-thru fare, and for the escape of stubborn farts. The car comes with A/C, but the massive amount of glass that makes up most of the roof and doors means that it'll have a hard time keeping up when it's your globe that's getting warmed. Also, who knows how much of a sweat you might work up shifting gears, as the seller doesn't bother stating whether it's an auto or a stick. The ad notes that the car has been lowered and is rocking a set of aftermarket 18s which the seller says are racing wheels. It also has been visually burdened with a number of decals including one of a Porsche on the nose in what must be one of those incongruous western fashion uses the Japanese love so very much. Aside from that, it looks like all the parts that you aren't going to find at your local Pep Boys are intact, and with its Starlet underwear it shouldn't need much more than the occasional oil change. But how in the hell would you register it so you could find out? The seller has no US title, only one from the Land of the Rising Sun, and is offering the car as PARTS, although that may mean that, like herpes, having it is something he's just going to have to get used to. One wonders if he has flunked the registering illicit JDM products portion of the SAT, how did he have the acumen to get the car off the boat and through customs in the first place? Seeing as it presently resides but one city over from my mom's basement, I might just go and ask, but probably not. I too am bereft of the wherewithal to make this JDM legit, but that doesn't mean it's impossible. If you concur, or even if you think this Toyota's is as likely to get a green card as it is to emulate Dumbo with those doors, how does its $4,999 price look? It should be noted that in the original Craigslist ad, the seller asked $5,999, but has lowered it a grand in his eBay listing. I'm putting them both together just to see who's paying attention. 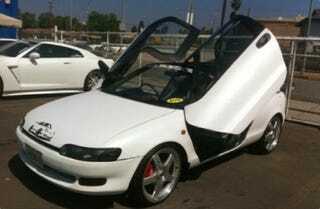 So, what do you think, is $4,999 a price that makes this JDM Toyota an illicit treat? Or, is it no fun, being an illegal alien? Craigslist or eBay or go here if the ad disappears. H/T to 4point2 for the hookup!